Tullamore Tidy Towns in conjunction with the National Biodiversity Data Centre bring you the first of the bumblebee monitoring scheme workshops for 2018. On the day we cover all aspects of the monitoring scheme including species identification, use of the online data capture system and an afternoon outside putting the skills into practice. Compared to many insects, bumblebees have a firm place in public affections as they are relatively large, furry and for generations we’ve appreciated the gentle buzzing of these “little musicians of the world” (A Marbán, a díthrubaig; 10th century poem). Ireland has 20 species of bumblebees and they are our most abundant and widespread wild pollinator with 4 out of every 5 wild bees being a bumblebee. In 2013, a worldwide study shows that the decline of wild bees and other pollinators may be an even more alarming threat to crop yields than the loss of honeybees. In addition, an estimated 78% of all our wild flowering plants (including shrubs and trees) require pollination. Therefore, not only do wild pollinators like our bumblebees pollinate crops that we eat, they also maintain the sexual reproduction and genetic diversity of our wild plants, and all the ecosystem services they provide. Consequently, as well as needing suitable areas for their nest sites, bumblebees are sensitive to the diversity and continuity of pollen and nectar supply from flowers. Therefore, bumblebees are ideal indicators of changes in our environment at local- and landscape-scales. Like honeybees, bumblebees are social bees that live in colonies with a queen, many female workers and some males. 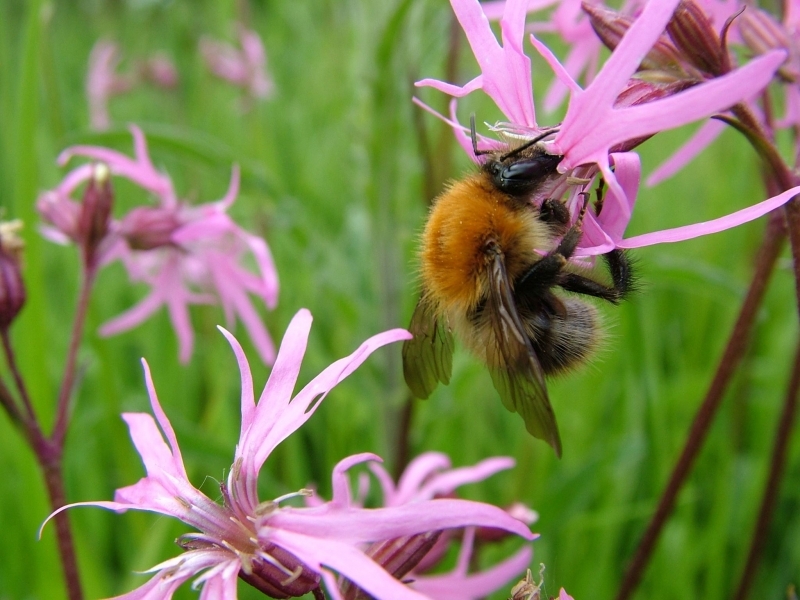 Of Ireland’s 20 bumblebee species, 14 are ‘true’ bumblebees and 6 are ‘cuckoo’ bumblebees. Cuckoo bumblebees don’t make their own nests or have workers, but specialise on taking over true bumblebee nests by killing the true bumblebee queen, then using the true queen’s workers to rear the cuckoo queen’s eggs. Most species emerge from hibernation over March and April, but some of our increasingly rare species do not venture out of hibernation until late May or June. After a queen emerges and spends some time feeding at flowers to build up reserves, they can be seen flying low to the ground conducting exploratory flights over rough grassland and along hedgerows. Queens travel 1-5 km away from the nest they were born in to establish their own nest. 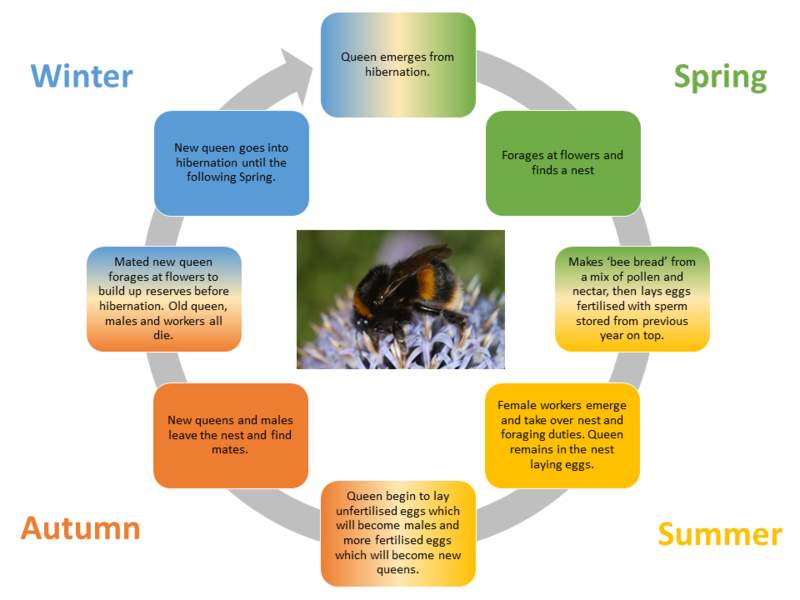 Buff-, White- and Red-tailed bumblebees like to nest underground in disused nests of small mammals, while the carder bumblebees prefer nesting on or just above the ground, in undisturbed areas with tall grasses and plenty of leaf litter. Worker bumblebees can fly up to 2 km away from their nest to find food, but most species prefer to forage within 200-500 m of the their nest. Bumblebees forage on a variety of different plant species, but individual species do prefer particular plants. Bumblebees don’t make honey like honeybees, but store nectar in wax nectar pots in the nest. This means that a bumblebee colony cannot store food over long periods of time and is never more than a few days away from starvation. Bumblebees have very powerful wing muscles and evolved a special trick to gather pollen from some flowers, like strawberries. Called ‘buzz-pollination’, the bees emit a high-pitched whine by rapidly contracting their wing muscles whilst rapidly running over the flower. The vibrations cause the release of a cloud of pollen from the flower that then sticks on the body of the bee. Males leave the nest and travel 2-10 km away to find a mate. Depending on the species, males adopt two different strategies when finding a mate: 1) they gather around a nest entrance then pounce on any new queens as they emerge; 2) they repeatedly patrol a scent-marked route from which they intercept and mate with any passing queen. Bumblebees queens can sometimes mate multiply, but the sperm from only one male is used to fertilise her eggs. Mated queens, after they have spent sometime feeding on flowers and building up their reserves, dig into leaf-litter or loose soils on north-facing banks to make a small chamber within which they overwinter. In urban and suburban areas, the Buff-tailed bumblebee, Bombus terrestris, now flies all year round. A small proportion of newly mated queens skip hibernation, establish their nests in the Autumn and then exploit the increasing amount of floral resources in our parks and gardens throughout the winter. On average, there’s 6-8 species of bumblebee in any location in Ireland, so once you get your “eye in” for your local species it’s easy to tell them apart. To start you off, there are some great identification guides for beginners on the Irish Pollinator Initiative site here and you can also purchase one of our pocket-sized identification swatches from our shop.